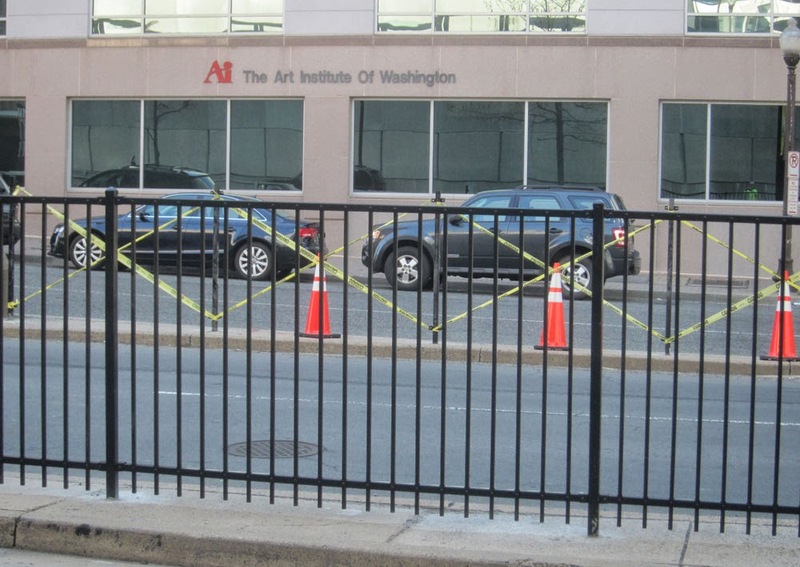 With creativity and craftiness, art students at Rosslyn's Art Institute have been cutting across Ft. Myer Dr. to get between the Rosslyn Metro station and the Art Institute. A new fence has now been erected to impede direct crossing. The students are now likely to walk further north to cross Ft. Myer Dr. at the end of the fence. That should make it easier for motorists to see the pedestrians cutting across the street. Notice how the yellow warning ribbon was artifully patterned with a triangular cross-stitch during the construction. That undoubtedly was a salute to the creativity of the students at Rosslyn's Art Institute. The Realize Rosslyn Plan Framework calls for eliminating the Ft. Myer Tunnel and making Ft. Myer Dr. into a two-way street. That's not likely to happen for a number of years. But when it does happen, the street will be much more friendly to pedestrians.